Frame:Fezzari Racing Design F1AH Alloy frame, 100mm travel, replaceable derailleur hanger, water bottle bosses. Handlebars: Fezzari XC mid-rise bar, 30mm rise, 31.8mm diameter 640-670mm width, shot-peened anodized 6061 alloy, black. Affordable – given its tech specs, the price is well worth it. It’s hard to find a weakness with the Fezzari Lone Peak model. Keep in mind that it’s silky smooth grey paint job is nice for not attracting would-be bike thieves like some of the more bright colored bikes (reds, yellows, etc…). 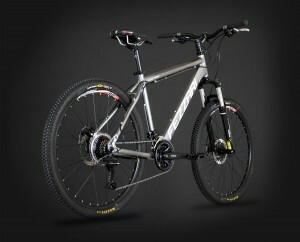 Conclusion: The redesigned Lone Peak serves as Fezzari’s entry level for its mountain bikes. 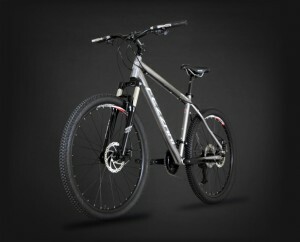 The specs are actually pretty good considering its price making it a good fit for beginner to intermediate riders. Over all it is an okay mountain bike but if you can shell out a little more, look at the Fezzari Kings Peak model or the Fezzari FXE SingleSpeed. Highly recommended for those with limited budget. You can buy the Fezzari Lone Peak direct from the manufacturer. They’re currently throwing in Free Shipping and $0 sales tax (Utah excluded), which can save you an additional $30-$40. This entry was posted in Fezzari, Mountain Bikes and tagged fezzari, fezzari lone peak, mountain bike. Bookmark the permalink.